Tip Size: 3.8" x 3" Square x 6.75"
Millions of exhaust systems are replaced every year due to corrosion and poor performance. Exhaust gases attack the system from the inside out while vibration, chemicals, road salt and other harsh conditions attack from the outside. When you consider the stress your exhaust system goes through, it's easy to see why you need a Borla stainless steel system. Axle-Back Exhaust System Kit: Comes with mufflers, exhaust tips and necessary mounting hardware. 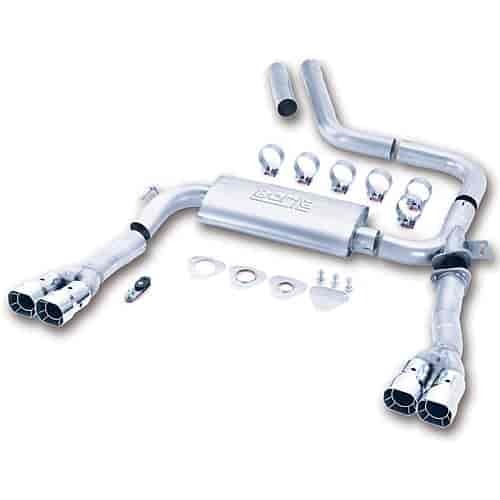 Cat-Back Exhaust System Kit: Comes with the necessary muffler inlet pipes, mufflers, tail pipes and exhaust tips. Does Borla 14780 fit your vehicle?